Delivering his first speech at 3-years-old, Jeff has always had a passion for public speaking. Over the past 20 years, Jeff has delivered thousands of motivational and keynote presentations on a variety of topics including disability awareness, self-esteem, and bullying. While the disabled population face several unique challenges, Jeff feels one of the biggest barriers to an inclusive Ontario is the lack of understanding and awareness of disability. Unless living with a disability or knowing someone with a visible limitation, many in our community are unaware of what the disabled life is like, and as a result, have problems understanding what support the disabled population needs to overcome the obstacles we encounter. 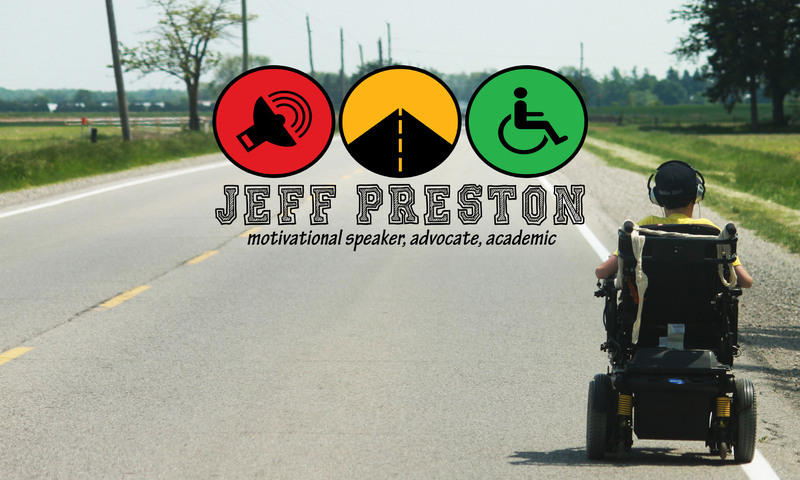 In his presentations, Jeff combines a rich collection of stories from his own life to educate about disability and to inspire the audience to tackle the challenges they face in their day-to-day lives.